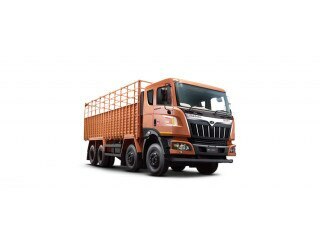 Dec 4, 2018: The Mahindra Blazo X31 is a quality goods carriage truck that has a very powerful engine and a good range of features. It comes with a customisable body with a cowl and a cabin with optional air-conditioning. The gross vehicle weight lies at a hefty 31,000 kilograms which indicate a high payload capacity. It is driven by a 7.2-litre BS-IV compliant engine that can churn out a maximum power of 274 bhp at 2,200 rpm and a peak torque of 950 Nm, coming at just 1,100 rpm. The produced power is transferred to the wheels via a 6-speed manual gearbox unit. The truck is suspended over Semi-elliptical leaf springs for both the axles. And as for the braking, the company offers the standard air brakes along with the addition of ABS as well.